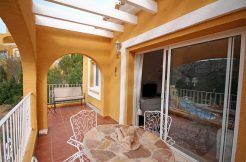 Modern villa for sale in Javea, Costa Nova.Beautiful villa that cinsists of 3 bedrooms, 2 bathrooms of which 1 en-suite, living/dining room, kitchen and open terrace with 8x4m pool. The property is specialy prepared for wheelchair users with wide doors, no doorsteps etc. The property also has pre-installation of hot water by solar boiler, air conditioning and central heating by underfloor heating (all pre). Al windows are PVC with double glazing, type Climalit. Under the terrace and the living room there is a space of about 80m2 that could be converted into an independent guest apartment with independent access or as a large warehouse, garage, fitness room or anything else to your liking.